Thayne-san, today I’m going to introduce you to Toshimaya Honten. Toshimaya opened in the first year of the Keicho Era, in 1596, before the shogunate was established in Tokyo. The business began with a shop located next to where lumber and stone were unloaded for the building of Edo Castle called Kamakura-gashi. Today the owner, Yoshimura Takayuki, is expecting us. Okay, let’s go in. Hello Yoshimura-san, pleased to meet you. I hear you’re the proprietor of a shop that’s been open for over 400 years. So what generation are you? Fifteenth! Were you told from a young age that you would take over the business? No, actually I wasn’t. I majored in chemistry at university, and after graduating I worked for a company as a researcher of viscose polymeric materials. As part of my research, I spent some time at New York City College of Technology in Brooklyn in America. That just happened to be in the year of the Tokyo Olympics〈1964〉, so I actually missed it completely. When my father asked me to come back home I was in my 40s. I reluctantly returned at age 42 to take over the shop. I imagine that was a time when you were most involved and excited about your research. Yes, that’s true. I thought long and hard about it, and I wondered if someone else couldn’t take over instead. But in the end, I decided that it was best for me, as the oldest son, to take over the shop, and that’s what I resolved to do. After hesitating, what reasons did you have for returning? I think it was the weight of tradition. I felt I couldn’t let it die with my generation. It’s not that I wanted to develop or expand the business, but that it was my mission to at least keep it alive. My son, who’s now the company president, also got a job as a researcher, but when he was 40, I asked him to help with the shop. I think he disliked the idea just as much as I did at first, but he came back. Family businesses have succeeded for generations due to a strong sense of responsibility. By the way, the shirozake (sweet white sake) that you have been making since the Edo Period is especially famous, isn’t it? That’s right. Shirozake is considered essential for the Hina-matsuri (Doll’s Festival) on March 3. Thayne-san, have you had it before? Well, go ahead and try some. It’s thick, and sweet! Very good. Do you use the same production methods you used in the Edo Period? We do. We make it the same way we always have. We ferment it in the cold of winter and begin selling it before Hina-matsuri. If you look at this woodblock print made in the Edo Period, you can see a huge crowd of people trying to buy shirozake. Whoa! Is this the original from the Edo Period? There sure are lots of people drawn here. You can see that the shop’s exit is separate from the entrance, right? That was to keep customers moving in one direction through the shop, to cut down on the confusion. You see these people wearing dark jackets? Those were carpenters hired by the shop to keep order. And they even had a doctor on hand in case someone got sick from the crowded atmosphere. 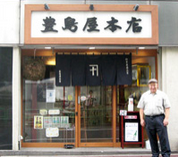 It was definitely a well-known specialty, and a famous place as well. Did you sell other kinds of sake outside of the shirozake season? Yes. At the time, people in Edo and the surrounding area didn’t know how to make good　sake, so we procured our sake from Nada, Fushimi and Ikeda sake breweries in the Kansai area. We also had a drinking area similar to modern-day izakaya. Here we sold our sake close to at-cost, so I hear it was really popular. But if you sold your sake at cost, you couldn’t make any money, right? Interestingly enough, although we didn’t make lots of money on the sake itself, we made profits by selling the sake barrels. And at the time, we only had to pay once or twice a year, whereas we had revenue come in every day. So with that money the shop was also involved in something like lending. With time, at the end of the Meiji Period, we began to make our own sake. At first the sake was produced in Kansai, but today it’s made in Higashi Murayama in western Tokyo under the Kinkon brand. We’re the only company to make sake used as sacred sake at the three major shrines in Tokyo of Meiji Shrine , Kanda Shrine and Hie Shrine. Fantastic. I’ll take a close look the next time I go to one of them. Actually I have a connection with brewery history as well; my grandfather’s grandfather ran a brewery in Scotland. I’d certainly like to see more people from around the world introduced to good Japanese sake. Yoshimura-san, you talked about how you reluctantly took over the shop from your father mid-career. But what do you like about this job now? More than anything else, I love to see people enjoy our sake. I do it just to hear people say how much they like it.